I call this Faux Calzone or Poor Man’s Calzone. I don’t know if it is because I generally write early in the morning and am usually hungry, or just because I like to eat, but food always seems to find its way into my writing. This is one “fictional” recipe that didn’t make it into The Mossback Cafe Cookbook (it didn’t fit into the concept), but this has long been one of my standby quick and dirty meals. I’ll start with a quote from A Curse That Bites Deep. Our hero Sam needs a quick meal but only has limited ingredients. The pantry is stocked with tidbits salvaged from a recently deceased friend, a solitary older gentleman of limited means. He settles on a cheap frozen pizza. Once the pizza was unwrapped and in the pan he slid it in the oven and checked his watch. After a couple of minutes he pulled it out and lifted one end. “It’s thawed enough,” he muttered as he proceeded to fold the pizza in half. He pressed the edges lightly. “Used to use more cheese when I was in college, but this will do,” he said as he moved the pan back into the hot oven. After a few more minutes he gingerly flipped it to brown the other side. When the allotted time was up he brought it out and tested the top with his finger. It was crispy but not burnt. He moved his meal to a plate and let it cool another minute before he tried a bite. I found it as a way to enhance a really cheap frozen pizza. 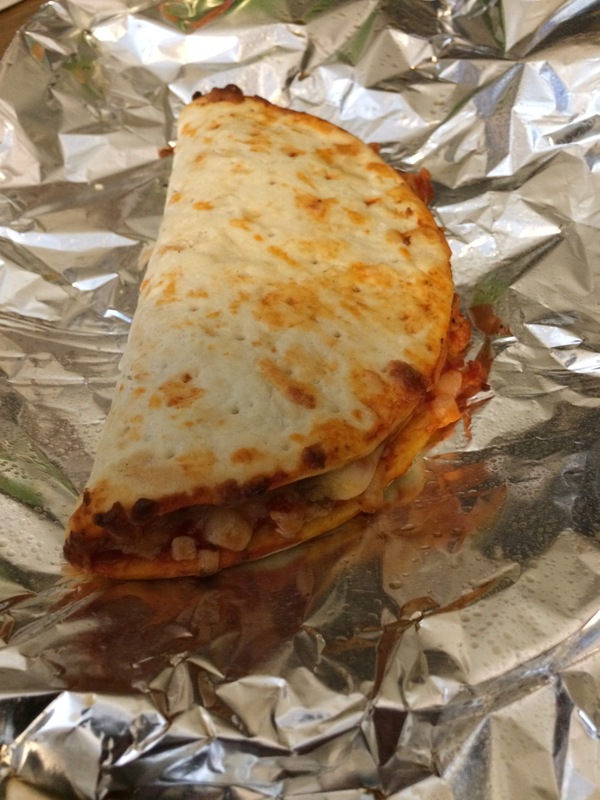 Sure, it’s not a true calzone, it’s almost more like a pizza taco, but it certainly moves the drab frozen pizza up a notch. I made these as an appetizer once, cutting them into strips, and people loved them. Years ago I worked as a consultant in northern New Jersey and one day we called in an order for some pizzas. I noted that almost everyone folded their slices in half before eating them; I guess it is a regional thing. I still do it, too, and it was the inspiration for this idea. Here’s what you do. You need a cheap frozen pizza. Totino’s will do but you can go smaller and cheaper if you want to. Although in the clip above Sam just cooks the pizza as it is, right out of the package, and you can certainly do that, it is better if you add a little seasoning and extra cheese. It’s frozen so you need to thaw it somewhat. At home, I usually use the microwave for that but you can heat it for a few minutes in the oven like Sam does in the novel. You want the crust pliable enough to fold. I made one of these yesterday and microwaved it for about a minute and a half at fifty-percent power. Take the partially thawed pizza and sprinkle it with some additional Italian spices if you want … or garlic powder, whatever you like. Sprinkle some shredded cheese on half of it. I added some Parmesan too, one “to-go” packet. Fold it over and press firmly. It’s not going to seal like a true calzone but that’s okay. You can still press down a little more along the edges to get close. Bake just like the package says, but bear in mind it was partially cooked earlier. If the package said to cook it for 10 minutes at 400, I’d do it for four, carefully flip it and do it for another four. Your mileage may vary. You want the crust to be crisp but not burnt or really hard. The extra cheese should just be starting to ooze a little. Take it out and let it cool for at least two minutes before eating but take it easy, the filling can be hot. That’s it, Poor Man’s Calzone, right out of the pages of my novel! As you can see from the picture, it looks pretty good. Simple, good, cheap. Who am I kidding? It was great! If we were having coffee today I’d be lamenting our lack of coffee sharing lately. I’d end with the “it’s not you, it’s me” explanation. It’s not that I don’t have anything to write about, but a few weeks ago I found myself glued to the weather channel watching news about my hometown Houston and Harvey. Then I was closely watching the doings of Irma … and even now, Maria’s course is still a bit of a question mark regarding the NC coast. Ah, hurricane season. Global Warming? Maybe. I’m not a naysayer but I’m also not firmly in the “we humans are totally screwing up our world” camp either. I think the earth is a much bigger engine than we give it credit for. Sheesh, thirty years ago scientists were saying the exact opposite: we were causing a general cooling trend, possibly starting a new ice age. Nobody made a movie about that though. If you follow planetary astronomy, you’d know that the ice caps on Mars have been in decline as well. We’ve thrown a lot of trash at Mars but I don’t think we’ve created emissions yet. Maybe there are solar causes for some of this? I don’t know. Nobody talks quite as much about the massive loss of tropical rainforests … probably because they are out of our control. I think they have a bigger effect on the global climate engine. And don’t get me started on contrails … sometimes half the clouds in the sky are contrails. Should be cut emissions? Sure. Couldn’t hurt. Save the rainforests? Definitely. Those are the scrubbers of the emissions. Recycle? Sure. But I had to wonder when my local program started just saying separate THIS, but not that … just put it all together. Okay, makes me wonder if that stuff is actually being recycled. Recycling depends on available markets for the materials. But I still recycle. Why? I have curbside recycling but not curbside garbage pickup. If I recycle, I cut down the solid waste I have to haul to the local garbage place by more than a half. Whatever works, right? But back to the hurricanes. We’ve always had hurricanes. Ever heard of the port of Indianola? Probably not unless you’re from Texas. Even then, probably not. It was once the second most active port in Texas. It was thriving. It was the county seat. It had a nice huge courthouse. It’s gone. It was destroyed twice in the late 1800s. In the 1870s, it was pretty awful but it was rebuilt. In the 1880s people sort of said, why bother after a massive storm really whacked it hard. All that remains are a few foundations and headstones. The county seat was moved and most of the town was reclaimed by the sea. Granted, if you follow hurricanes and the Texas gulf coast they built the town in the exact worst place. Countless storms, including the massive Carla in 1961 and this year’s Harvey would have hit it again. I live about 200 miles inland from the NC coast. It’s far enough to not worry too much but close enough to take notice anytime a storm is out there. I’ve lived here almost thirty years … one storm whacked us pretty good inland in the mid-nineties. Everybody I know in Florida did okay through Irma. Most people I know in Houston came through okay, and those unlucky few are alive and working through the rebuilding process. Global Warming? I don’t know. It seems to me that blaming Global Warming outright for a bad storm season is sort of along the same lines as saying God is punishing us for this or that. It’s just a bad storm season. Keep your eyes on the sky and a few extra cans of something for an emergency. Oh, and coffee. I wish I had a gas stove.